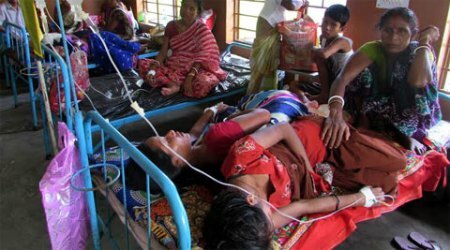 165 lives claimed by Japanese Encephalitis in Assam, India. A total of 165 persons have lost their lives in Assam due to Japanese Encephalitis and Acute Encephalitis Syndrome. Chief Minister Tarun Gogoi held an emergency meeting in the wake of the disease outbreak. Health authorities have been alerted to control the disease from spreading to newer places. Japanese encephalitis claimed 165 lives in Guwahati: Japanese Encephalitis (JE) and Acute Encephalitis Syndrome (AES) has claimed 295 lives and affected 1,727 persons so far this year in Assam. Twenty-four of the 27 districts of the state have been affected by the killer disease. Barpeta, Nalbari, Darrang, Kamrup (Rural) and Kamrup (Metro) in Lower Assam were the worst affected, while the Upper Assam districts of Tinsukia, North Lakhimpur, Jorhat, Dibrugarh, Dhemaji and Golaghat were also hit by the disease. Measures to combat the disease were continuing with fogging, regular supply of vaccines and medicines to hospitals, district hospitals and setting up of health centres. Awareness campaigns are also being conducted at all levels to keep the disease spread in check. The chief minister of the state has directed for proper mapping of areas where water-borne diseases are acute, must be carried out by the Public Health Engineering Department (PHED) and necessary measures be taken up to provide clean drinking water to arrest the incidence of AES cases.